Please call 1-800-826-4554 or email info@nullingallsconveyors.com to contact one of our engineering staff members about your specific spiral chute requirements. 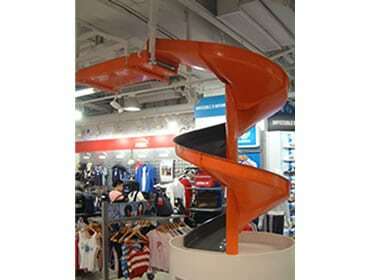 The ChuteMaster Fiberglass Spiral Chute saves floor space, is economical and virtually maintenance free. It provides a safe, secure means of lowering your products. Specially designed fiberglass module profiles help control the descending speed of your products. 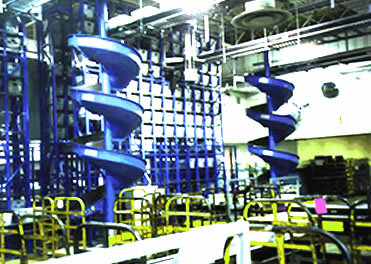 In high humidity situations, the self-starting characteristics of the gel-coated fiberglass assists products to flow freely, gently and safely. The STS Spiral Tote Slide is an economical way of lowering plastic tote boxes. Each STS Spiral Slide is specifically designed to accommodate the size and sliding characteristics of a particular plastic tote box. 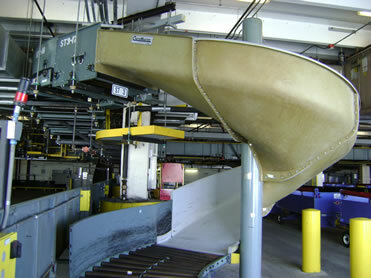 It is the perfect solution for applications with a continuous flow of a standardized plastic tote. 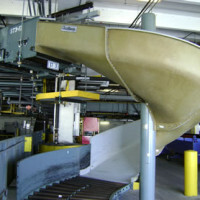 The design ensures a controlled descent and the optional exit swoop ensures a smooth transition to the adjoining conveyor. An efficient and effective design that utilizes gravity and skatewheels to move trays from one level to another. Each module has a flat bottom with vertical sides to contain the trays/totes and assist in maintaining tray/tote orientation. 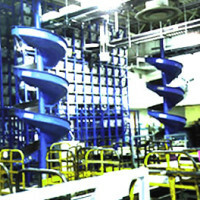 Product descent is controlled through the unique spiral design. 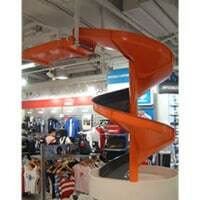 It is constructed out of durable hand-laid fiberglass and is an inexpensive alternative to conventional equipment.